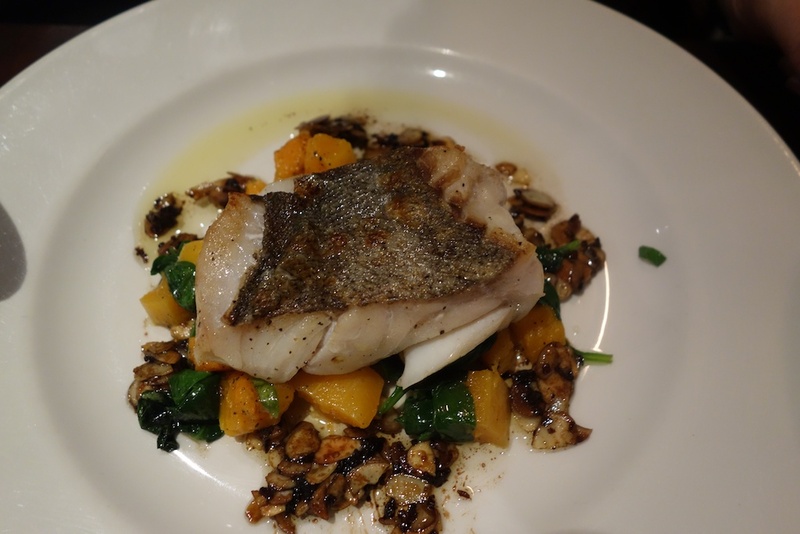 Wedgwood is an innovative restaurant in the Canongate that I’ve visited before for their good value lunch (review here). I’ve always wanted to go back in the evening and, after walking past it a couple of weekends ago, we decided that it looked good and we’d just get on and book it. Tuesday evenings can be a bit dead but the street-level part of the resto was full when we arrived. The menu looked great – I could have chosen anything. 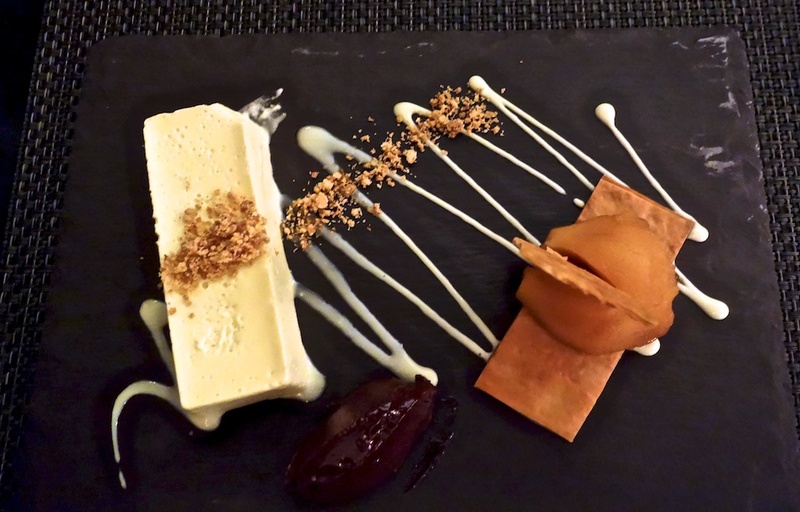 I was intrigued by the Sea Aster Panna Cotta but was put off when we asked what Sea Aster was by the description of ‘vaguely salty’ – I suspect that the waitress had tried it but hadn’t been impressed. So, I decided on the Leek and Cheddar Bread and Butter pudding with Chanterelles and Soused Fennel. 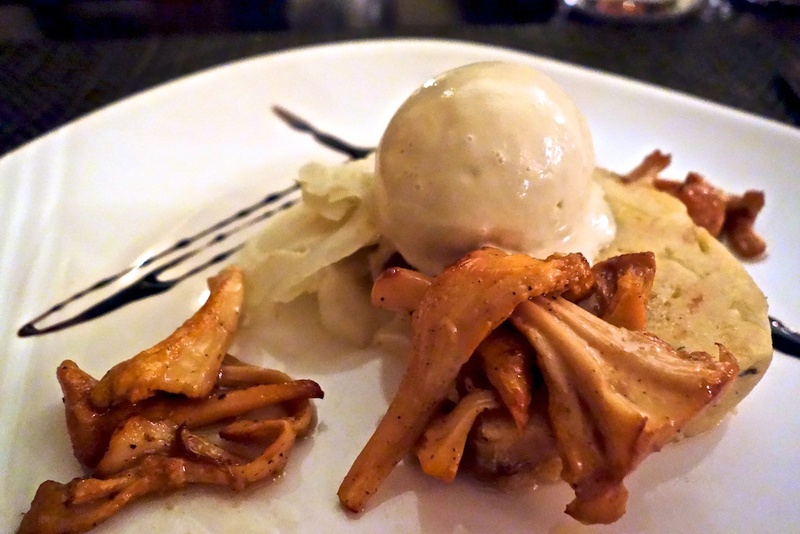 It also came with a blob of savoury ice cream, which I think was fennel flavoured. I really enjoyed the starter, which looked wonderful. The ice cream and the mushrooms were absolutely superb but I found that their dominant flavours overwhelmed the more delicate cheese and leek pudding. Others had the lobster thermidor creme brulee – I’d had this before and it was delicious. 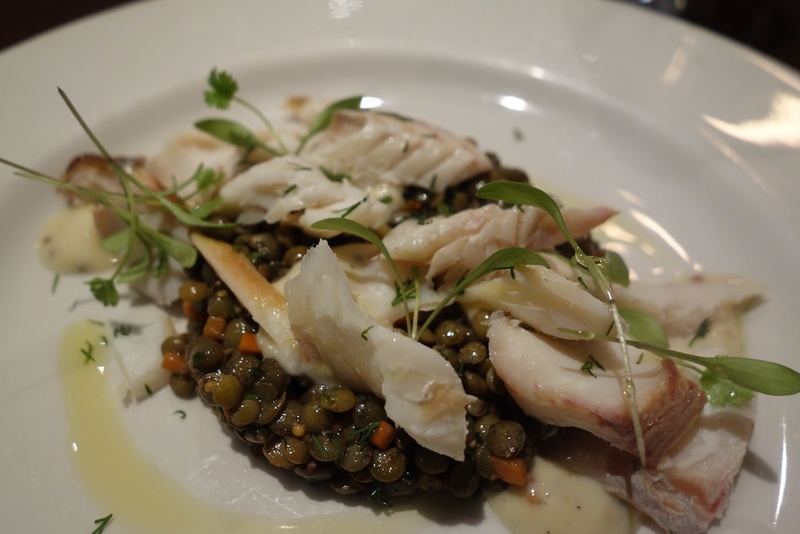 It was equally difficult to chose a main course – again, I could have eaten anything on offer. 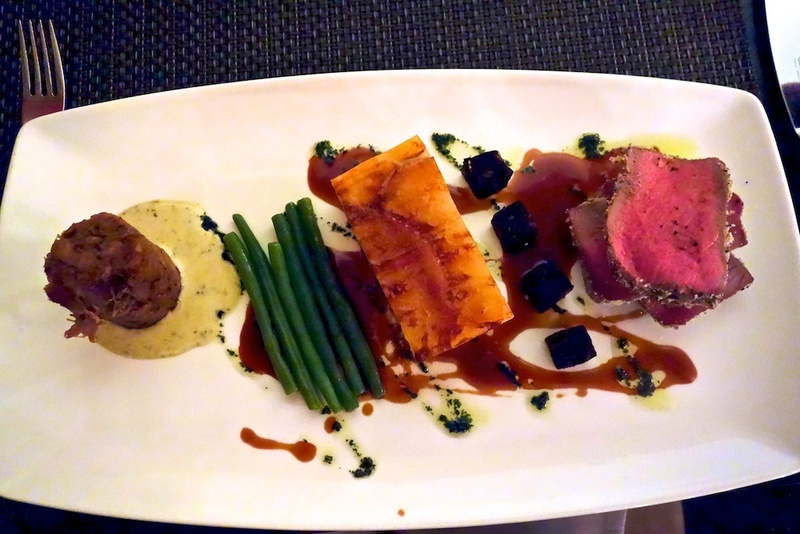 I finally settled on seaweed crusted lamb loin with truffled goat’s cheese dauphinoise, braised neck of lamb, black pudding and anchovy cream. This was one of the best dishes I’ve had for a while, a fabulous mix of flavours and textures which was perfectly cooked and presented beautifully. Others had the pork tasting plate, the aubergine and goat’s cheese cannelloni and rabbit, broad bean and chorizo risotto. My tastes of these suggested they were just as good as the lamb. Wedgwood has a fabulous wine list which is not cheap but not ridiculously over-priced. We decided to experiment with an English white and an Austrian red – my first experience of both of these. Everyone was very dubious about these when I chose them but they were great. Definitely worth a try. I wasn’t as taken with the pudding menu but swithered between the blue cheese cake and the pear tatin. I went for the pear tatin, expecting something with a nice sticky sauce. I was a bit disappointed with what I got – perfectly nice pear on a bit of pastry but no sauce. The pear was accompanied by cocoa creme and pear mousse but I felt a bit hard done by without the tasty tatin caramel. A perfectly nice pud but, for me, the weakest part of the meal. I tasted the blue cheese cake and wished I’d ordered that. Finished with coffee – which came on its own. It would have been nice to have had a couple of petits fours each, something that is normal for this class of restaurant. 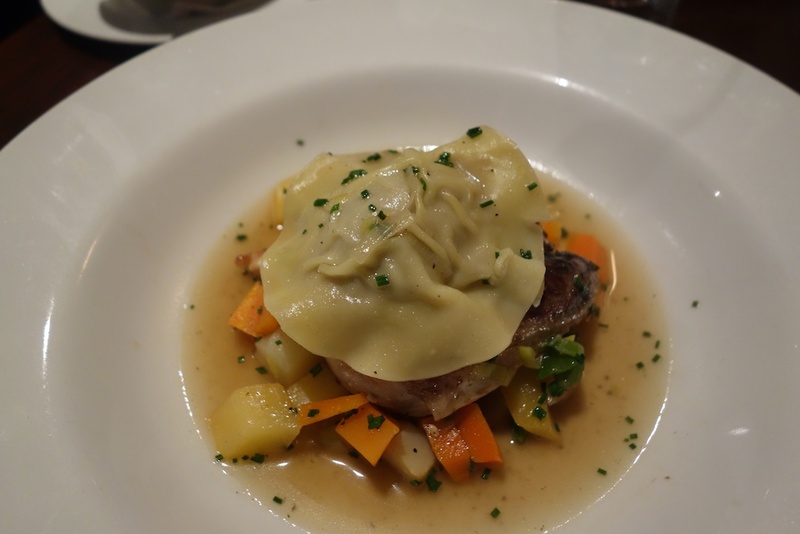 Overall, it was a great meal with interesting wine – not flawless but not far away. It worked out at about £50 each, which for this quality of food is really not too bad. Highly recommended.